When to use Emergency Heat & What is Emergency Heat Setting? 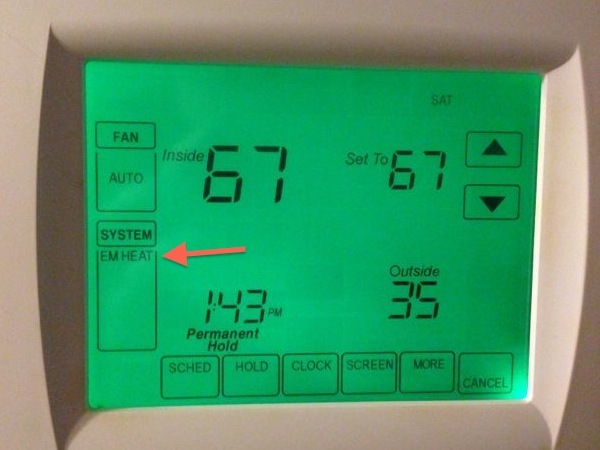 When on a service call we frequently get asked what the “EM Heat” setting stands for on the thermostat. Even worse sometimes we see thermostats set to this setting when we arrive. Emergency Heat is one of the most commonly misused and misunderstood elements of heating and cooling. In this post, we will attempt to answer any questions you may have about emergency heat and when to properly use it. Here in central Indiana, all heat pumps need a secondary source of heat to keep up with heating needs in the peak of Winter. In many cases, this is a series of metal coils that use electricity to create heat much like a toaster. When the system is functioning properly these coils will occasionally turn on to help the system keep up with dropping temperatures around the outdoor unit. Setting your thermostat to emergency heat causes the outdoor unit to turn off and heat the home with only the indoor supplemental heating unit. Many think that emergency heat should be turned on when temperatures drop below freezing outside, this is not true. When to use Emergency Heat? As the name implies emergency heat setting is for emergencies. You should only turn it on when the heat pump is not working. Modern heat pumps can still perform in below freezing temperatures and provide efficiencies not found when operating on supplemental heat alone. Efficiency is the key word here as the supplemental heating unit uses a lot of electricity. Emergency heat will increase your electric bill, sometimes by hundreds of dollars a month. This is why you should give us a call as soon as your system fails. Emergency heat can hold you over until we arrive, but should not be used as a long-term solution. A little water and ice at the bottom of the unit are normal. This means the defrost cycle is operating properly. Speaking of the defrost cycle, if you notice a large plume of steam coming from the unit periodically that also means it is working properly and not on fire. Be sure to check your heat pump regularly during the winter months to make sure the unit is not fully blocked by snow or leaking any fluids. A little water and ice at the bottom of the unit are normal. This means the defrost cycle is operating properly. Speaking of the defrost cycle, if you notice a large plume of steam coming from the unit periodically that also means it is working properly and not on fire. If your unit does fail to give us a call right away and we will send out a qualified heating service tech to repair your heating system.